What is a demonstration site, if there is nothing to demonstrate? Why does it take so long to get things implemented? Isn’t the technology already there? These are important questions for a Site Manager to handle and find answers for. Now that many of the GrowSmarter smart solutions are entering the implementation phase, I will shortly summarise the experiences from the preparation and planning phase. I will also give an update on the implementation status of the smart solutions and how they are being rolled out. Preparation and planning; what have we learnt? In Stockholm a range of smart solutions for low energy districts, as described in my previous blog post, will be rolled out in three building zones: Valla Torg, Årsta and the Slakthus area (see map). Preparation to implement our numerous energy efficient measures started quite some time ago, even before our GrowSmarter application was submitted back in May 2014. One key issue was to decide the baseline; what can be done in older buildings and how much energy could each measure potentially save? For this purpose a consultancy firm was appointed; they helped us to assess and identify which measures would be most suitable. This gave us a good starting point for implementation, however the order in which they would be implemented, had to wait until we had our refurbishment plan in place. Our refurbishment plan not only needed to detail construction costs and time and but also address simple questions like: Does the smart solution need electricity, data connection, wireless data transmission possibilities? As such, several meetings bringing together construction planners and industrial partners were held starting from March 2015 to February 2016. This extensive preparation and planning work was vital to ensuring that all the necessary specifications were included, to be sure that everything will work the way that it should. Key learning: is to include smart solutions within the general planning process and to avoid implementation becoming separate to the actual construction process. This is the approach we have taken in GrowSmarter, so when an electrician or plumber is doing his/her work, (s)he is also implementing GrowSmarter solutions. Valla Torg (building zone #1): we are about to start with the energy efficiencies and solution 1 (smart climate shell refurbishment) of the residential building in Valla Torg together with Skanska. More update on this in my next blog! Årsta (building zone #2): In the private condominium Brf Årstakrönet the activities solution 1 (Efficient and smart climate shell refurbishment) and solution 3 (Smart energy-saving tenants) started in January 2016. Veolia has installed a temperature sensor in every apartment, which logs information about indoor temperature levels. The target is to stabilise indoor temperature as far as possible, by controlling and steering heat into the building. In the diagram below, you can see information collected from the building to be able to optimise its energy use. The yellow line indicates the indoor temperature and the blue line the outdoor temperature. Traditional temperature regulation is based on outdoor temperature which means that it sends hot water (indicated with the purple line) at night into the building regardless of the need. By controlling both indoor- and outdoor temperature, you can postpone the need for hot water, and lower heating costs. Veolia has also started preparations to install solution 4 (photovoltaics) on the roofs of the building together with a new innovation developed in Sweden called the Energy Hub. The energy hub controls energy flows between solar cells, energy storage (battery), local loads and the grid. Veolia will also implement a module called Adaptive Current Equalisation (ACE). The ACE technology continuously monitors the grid currents. If one of the three phase currents exceeds a pre-set threshold, available energy from the other two phase conductors are used instead. This prevents overloading of mains fuses and can even allow the supply capacity to be reduced and hence the associated grid fees. Slakthus (building area #3): Refurbishment of the Slakthus area buildings will start in May/June. 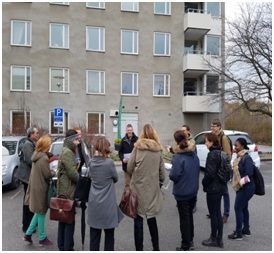 The picture below is from a study visit where Royne Julin from the Stockholm City Real Estate Administration is presenting the refurbishment and energy efficiency measures in the buildings for an international group of visitors. In April this year, we started with the installation of solution 5 (smart LED street lights) which will be finalised by the summer in Valla Torg. The LED street lights, 25 Luminaires installed by the Stockholm City traffic Department will be an opportunity to showcase the benefits of open standards in enabling interoperability within intelligent lighting systems. Using integrated light controllers and associated software, the Luminaries will be connected to outdoor Wi-Fi networks (via the radio frequency (RF) mesh network) and run by an automation system (Power-lin communications (PLC) networks) to reduce energy usage, operational costs and improve safety. The potential exists to expand the RF mesh network to connect other city devices such as traffic lights, meters and different sensors. This possibility will be explored in more detail as part of the measure traffic posts as base of sensors. 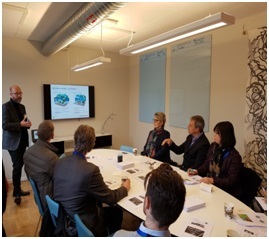 In the picture above, Anders Hedlund from the City of Stockholm’s Traffic Administration is presenting smart LED lighting solution to an international group of visitors participating in the Eureka Innovation week in Stockholm. The building in the background is one of the buildings to be refurbished in Valla Torg. •	in Farsta waste heat from supermarkets (some 5km south of the Slakthus area) will be used. As soon as agreements are signed, implementation will start. Here Mr Hedman, from Fortum is presenting the open district heating solution. More information about this solution can be found here. In March, IBM, which is responsible for the open consolidated big data platform (solution 8), has conducted a Design Thinking workshop with the city’s traffic department to define which users to focus on and which problems to address. 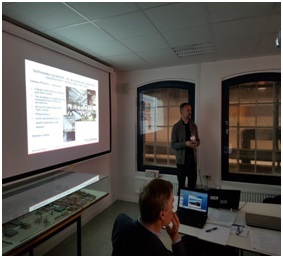 Work continues with Stockholm’s Traffic Department and STOKAB/St Erik Communication to demonstrate the open data analysis and innovation platform to connect IOT devices, existing traffic data sources, as well as, assessing the need for new potential sensors e.g. video sensors. The delivery boxes (solution 9) will be installed alongside the refurbishment in Valla Torg. A survey of travel behaviour (solution 10) in Valla Torg has been done. The next step is to study two other locations in Stockholm and analyse reference groups. As part of the GrowSmarter project, Fortum will install 10 charging stations and one fast charger (see image left - ©Stockholm)(solution 11). The fast charger will be put up in Årsta. The other charging stations will be put up in BRF Årstakrönet, Slakthus area and Valla Torg. The implementation has started. 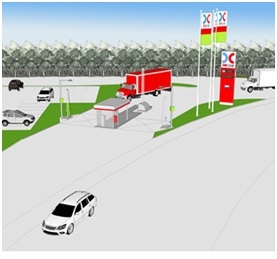 Contracts for the first two refuelling stations (solution 11) have been signed and the third is on its way. The filling station in Årsta is shown in the picture. 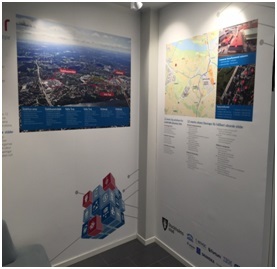 Information centres in Valla Torg and Slakthus area for citizens and other interested visitors are now open! The grand opening was held in 28 April when a study visit was organised for an international audience from Asia, Europe and North America. A second study visit took place on 19 May with visitors from the different departments of the City of Stockholm. The picture (Information centre ©Stockholm)is taken from the information centre in Valla Torg.